Hello there, my name’s Edna. Edna Sweet. Nice to meet you. If you’ve got stuck in traffic just outside Oxford – maybe on your way to see its famous spires and colleges – you might have seen the signposts to the village where I have my tea shop, or maybe not. It’s a small place, and we’re all rather glad we don’t get the tourists some of our neighbors do. But that doesn’t mean there isn’t good trade for me here. Indeed, since I opened my tea room a month or so back, it’s all gone a lot better than I could have dared hope. I think my toasted teacakes have a lot to do with my success; I use a family recipe and make them from scratch, every day. And I never use one of those nasty toaster things - no, I pop them under the grill at the top of the stove so they only toast on the cut surface where they’ll be buttered, leaving the underside nice and soft. Oh heck, have I given away a secret now? Ah well, you can try it at home if you like - you’ll find it makes a big difference. I’ve dreamed of owning a genteel tea shop in a quaint village since I was about ten years old when I was living in anything-but-quaint North London…and now I’ve finally made it happen. I spent weeks clearing out the place I bought; I’m surprised the previous owner hadn’t killed someone, the kitchen was in such a dreadful mess. 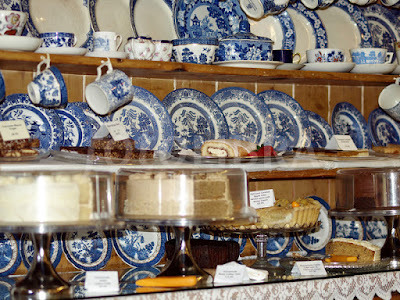 But now everything’s just right: blue and white gingham tablecloths, dark wood tables and chairs, and a lovely big Welsh dresser bedecked with classic Willow Pattern china. Perfect. At least, that’s what I thought…until I overheard a conversation the other day that set me back on my heels. I’m wondering if I was mistaken…why on earth would anyone be talking about poison in my tea room? You can meet Edna Sweet – and a host of other characters – in Cathy Ace’s brand new anthology MURDER KEEPS NO CALENDAR, which is available for pre-order at amazon.com now! 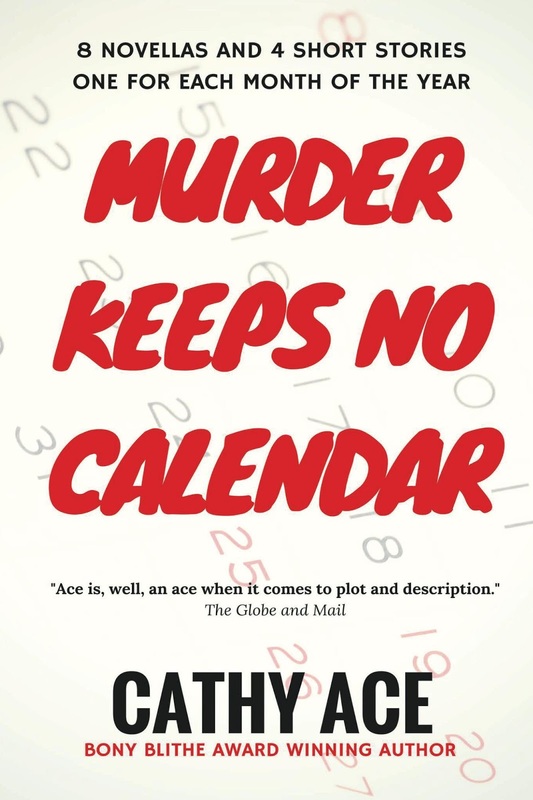 GREAT NEWS…If you’re a fan of Cathy’s Cait Morgan Mysteries you can find out how Cait Morgan and Bud Anderson first met, and for those of you who enjoy spending time with the women in Cathy’s other series, The WISE Enquiries Agency Mysteries, you can be there when the four women decide to set up in business together! The anthology contains eight novellas and four short stories – one for each month of the year – two of which have already been produced for BBC Radio 4. The book is available for pre-order on Kindle NOW, and print copies can reach you before Christmas...what a super gift idea - right? Enter today to win a print copy - Cathy will contact the winner on Thursday afternoon. Leave a comment below by midday, Eastern, on Thursday 23rd November (with your name and an email address) and your name might be plucked from the proverbial hat to win a print copy of the book. Good luck! Open to anyone, anywhere in the world! From reading the above I know I'll enjoy this book. Thanks for giving me this opportunity. Ginger is my name, my address is: gheruska44(at)gmail(dot)com Happy Thanksgiving! Sounds great...thanks for the contest. I would love to visit a shop like that. Seriously who would talk about *that* in a tea shop? So gauche! Thank you for your writing and your kind offer. Nice to meet you Edna :) I'd love to visit a tea shop like yours! I guess i'll have to settle for reading about one! Happy Thanksgiving! Thanks for the chance to win. That sounds wonderful! Thank you so much for the chance to win! Edna does seem a bit "dithery". As I always tell Dru, please toss my name into the magic hat and I hope I'll be the happy winner. I think her books are very good reading and look forward to this one. The tea shop sounds so wonderful. Sounds like my kinda read!!! I would love to get my hands on another Cathy Ace book, even if you touch it first! Hi Edna. I'd love to visit your teashop. Sounds adorable. 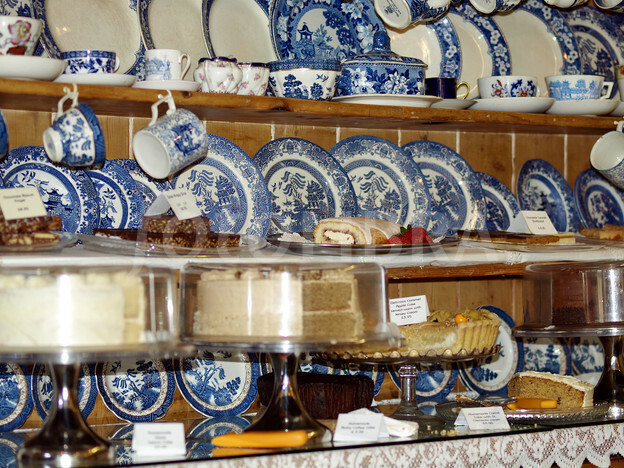 Do you know Gemma at the Oxford Tearoom? I'm Joanne. joasia9(at)hotmail(dot)com. Hope to visit with you soon. I'd love to visit the teashop----and to win the new book. Happy Thanksgiving! Oh I love Cathy’s books.i started with the women of the WISE detective agency. And then found out that she had a series set in Vancouver Canada I had to read it. As I grew up there and knew the city well. Cathy, Sorry I'm not familiar with your writings. Looking forward to reading your books. Happy Thanksgiving. A book to read while waiting for The Case Of The Unsuitable Suitor - thanks for the chance. I loved meeting Edna Sweet. I can tell from meeting her that I'd love to read MURDER KEEPS NO CALENDAR and learn about her friends and neighbors as well. Would love to read more about Edna's Tea Shoppe. Sounds delightful. Happy Thanksgiving! Love the sound of the reading & teacakes thank you. Oh my this sounds like a great book, I have recently started to enjoy short stories and anthology books - think it is an age thing! Cait and Bud and the WISEWomen in one book - wow wants not to like! This sounds like my kind of book! Thanks for the opportunity to read it. From what you shared, I know I will enjoy reading this book. Thank you so much for sharing.